This book explores the locomotion of dogs in a highly scientific yet easily accessible manner. An innovative illustrative style brings the dog anatomy to life and makes clear the way in which the skeleton, the muscles and locomotion fit together. 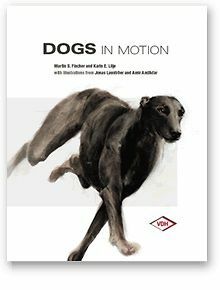 Based on the results of the largest-scale study on the subject ever carried out, an experiment which involved over 300 dogs and 32 different breeds, the book delivers completely new insights into the motion sequences performed by dogs. The accompanying DVD features over 400 movies, X-Ray movies and 3D animations and demonstrates both the variety and uniformity of dog locomotion with unparalleled precision and clarity. Inclusive DVD (3 hrs. 15 min). The DVD is without sound. Hardcover: 208 pages Publisher: The Pet Book Publishing Company Ltd (February 24, 2016) ISBN: 9783981433906 Weight: 1150g Muuta: Inclusive DVD (3 hrs. 15 min). The DVD is without sound.